Serrated steak knife marked Stainless Steel Japan. The handle is a Bakelite/plastic material. 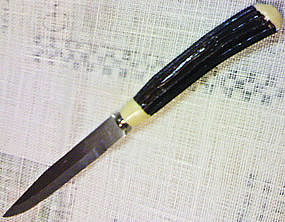 The knife looks very much like a Stellar, but it is not marked as to manufacture. It is 7 1/4 inches in length. There are slight usage marks to the blade. There are 7 knives available for purchase and are priced individually. I need your zip code to calculate the postage.